New Year in Budapest, 31. December 2019 – 01. January 2020. If you plan to celebrate New Year in Budapest you won’t be bored. You can pick from plenty of programs from upscale balls to local house parties. Let’s not forget the spectacular fireworks at midnight! Hungarians are very good at partying. We’re people who look for every occasion to eat and drink well. One of these special occasions is the last day of the year, Szilveszter in our language. People start preparing for New Year’s Eve several weeks before. In some popular entertainment places you have to book your New Year’s Program months before. champagne and further meals and drinks at midnight in the elegant salon setting. A worthy location and event to welcome 2019! Tickets: 179 EUR/prs (available in limited numbers). Party away on a special New Year’s Eve-themed ruin bar crawl on 31. December. 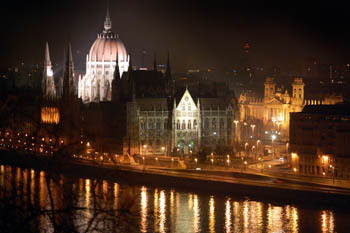 the enchanting sights of illuminated Budapest that you can see on a 2-hour trip. The New Year’s Day boat excursion will be hosted on the spacious and elegant Europa Ship. 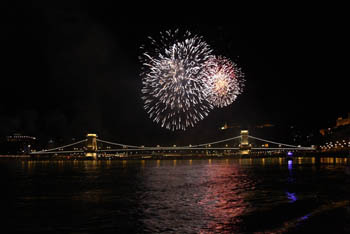 What can be more romantic than welcoming the New Year on aan elegant party ship on the Danube? 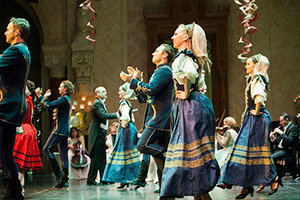 plenty of dancing and fun ensures a memorable New Year’s Eve party in the Hungarian capital. 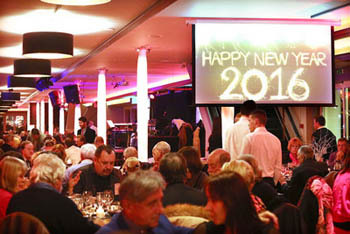 See more details about the New Year’s Eve Party in Budapest. The concert hall of the Duna Palota hosts a two wonderful concerts on 1st January. 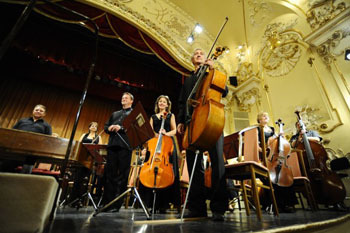 Starting at 17.00 you can enjoy a 70-minute performance by the Danube Chamber Orchestra. The comcert celebrates this special day with timeless classical pieces by Mozart, Liszt or Gershwin. Blue Danube Waltz, and Radetzky March by Strauss and many more. Tickets: in 3 categories + VIP for both concerts. 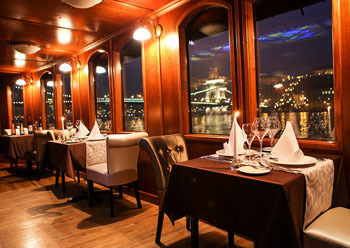 TIP: See also our selection of Budapest restaurants that offer a New Year’s Eve Dinner/Party! Venue: Budapest Congress Center, Jagelló út 1-3., district XII. Tickets: concert + dinner + wine: 107 EUR, concert + wine + snacks: 72 EUR, concert + wine tasting, between: 37 – 53 EUR. 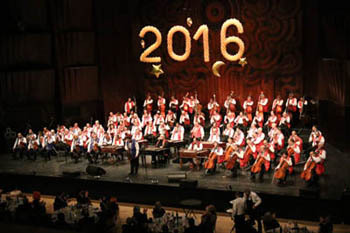 The end-of-year gala concert of the Hundred Member Gypsy Orchestra is organised each year. This year the spectacular performance is combined with a four-course dinner with great Hungarian wines (the dinner is optional). 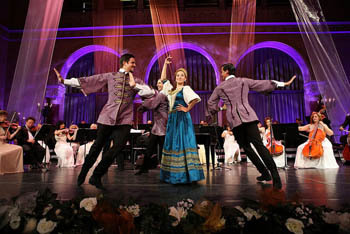 The festive concert is a wonderful pre-New Year’s Eve program in Budapest. Most people in Budapest head for a restaurant, bar, café or pub to carouse on 31st December. You have to book well in advance, especially in popular places. If you have no reservation, go early and you might get in with some luck. There’s usually a substantial dinner that includes special dishes. A glass of champagne is usually included in the price to clink glasses at midnight. other traditional Hungarian New Year dishes are served after 24.00. You can dance away all the calorie intake. Prices are around 40 – 300 EUR, depending on how popular and upscale the place is. TIP: Liszt Ferenc Square on Andrássy Avenue offers many trendy cafés and bars. Pick a place here and you’ll be close to the outdoor festivities on Nyugati tér and Oktogon. A 3-day celebration with lots of drinks and food. The guest country is Russia and their national drink, vodka will be in the focus: you can taste 30 various types of the hard liquor. there will be street food too. If you don’t like vodka you can sip pálinka, mulled wine, local sparkling wine. 50% discount on food prices on the first day of the three-day feast, 29. December. Budapest’s largest, free pre-New Year’s Eve Party will take place here too on 30. December. On 31. December you can say farewell to 2019 on a family masquerade ball. Nyugati Square (M3 metro line, trams No 4, 6) – always a popular meeting point and it’s no different on the last eve of the year. Oktogon (trams No 4, 6) – close to Nyugati tér, at the junction of the Grand Boulevard and Andrássy Av. the Party District – Gozsdu Court and other parts of district VII. – the eclectic Jewish Qrtr., home to the ruin pubs: Kazinczy Street, Király Street, Dob Str. Spectacular fireworks welcome the New Year on all three places. Don’t forget to put on warm clothes, because last days of December tend to be chilly in Budapest. You’ll find many people in the streets, especially around midnight. Even those who have been carousing in a restaurant or bar, pour out onto the streets and celebrate the New Year with singing, dancing and blowing paper horns. Luckily government has banned the use of firecrackers, so celebrating will be safer in the crowded streets, than it was in previous years. Most hotels offer Special Packages for the New Year’s Eve period. Usually you have to stay for at least 2-3 nights. A festive dinner and entertaining programs are included. Choose a hotel in the city centre and you’ll find many places of entertainment within walking distance. You can join the happy crowd in the streets and enjoy the fireworks as well. 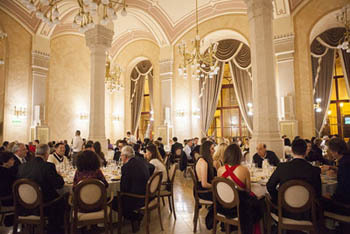 TIP: The Four Seasons Hotel Gresham Palace and other 5-Star Budapest Hotels have great New Year’s Eve programs each year with delicious, multiple-course dinners with spelndid wines and champagne. View our selection of Luxury Hotels in Budapest and 4 Star Budapest Hotels. If the above programs don’t appeal to you, stroll in Budapest on New Year’s Day afternoon and someone might invite you to a home party. Hungarians are famous for their hospitality and we tend to be even more welcoming on New Year’s Eve. During the day services run according to Sunday schedule. Tram 4 and 6 (along Nagykörút/Grand Boluevard run all night long – at 3-4 min frequency till 02.00 am then at every 5 min till 05.00 am on 01. January 2019. The M2, M3 M4 metro lines operate till 01.00 am and the night bus services run more frequently. First metro trains leaves terminus at around 4.30 on 1st January. Public transport services operate according to holiday/Sunday schedule on 01. January. Shops are allowed to stay open until 16.00 on 31st December but many of them close earlier, at 14.00.
museums are closed on 01. January, New Year’s Day which is a public holiday. Most Hungarian New Year traditions are related to food. Having lentil or bean dishes on New Year’s Day makes you wealthy. Pigs root out your fortune, while poultry scrapes it away. Eat roast pork on New Year’s Eve and you’ll be lucky throughout the year. 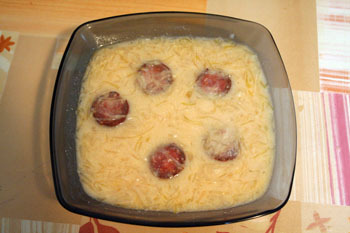 For hangover we eat a special soup (korhely leves) made from pickled cabbage and sour cream. Eating lentil, strudel and fish (the scales symbolize coins) will bring wealth. According to common belief, the whole year will be like the way you behave on 1st January. You’d better be happy to drive away gloominess in the New Year! Love and weather divinations were also common in villages, nowadays these traditions are practised less and less..
Why Celebrate New Year in Budapest? You have many options where to say good bye to the old year in the Hungarian capital. From an exclusive ball to classy hotels, trendy restaurants and bars, or a boat on the Danube. Make sure you book early! The best place to make friends and see how Hungarians welcome the New Year is at a home party. Hungarians are very friendly and hospitable. Alcoholic drinks (wine, sparkling wine, beer, liquors) are quite cheap here especially when you buy them in shops, supermarkets. But drinking in bars and clubs is also more affordable than in western European cities. Food is reasonably priced too and you can easily find inexpensive, good-value accommodation at a great central location. Last but not least Budapest is a beautiful, historic city with a lot to do and see- a perfect location to welcome the New Year! I hope you will come and have a good time! Happy New Year, that is Boldog Új Évet in Hungarian!